- ESPAGNE – Villajoyosa – The Museum of Villajoyosa under the direction of archaeologist Paula Bernabeu, has discovered the importance of eleven pieces of copper from the Roman period found in various excavations that have taken place in the town in recent years. Six pieces from Roman sites in Villajoyosa were excavated from four luxurious villas and stately homes and two cemeteries. Councillor for Culture of the city of Villajoyosa, Pepe Lloret, said, “Archaeologist Paula Bernabeu has produced important work on eleven unique bronze objects from Roman times. These studies are key to understanding the provenance of these items, to give them the prominence they deserve in the new museum and to understand the effort involved to excavate, recover, restore and research.” One of the most important and well preserved items is a decorative plate from the town of Barberes Sud (still under excavation), a very rare piece dated between 50 and 200BC, thought to have decorated an atrium or main courtyard of a temple. Another find of great importance and exceptional value is the ‘crepitaculum of Somnus’ (rattle of the God of Sleep) of Creueta, dated around 100BC. - GEORGIE – Tbilisi - While exploring the vicinity of the 40 martyrs' church, Georgian archaeologists have discovered the remains of an ancient mother-fortress at the Metekhi Bridge, located in the old part of Tbilisi. 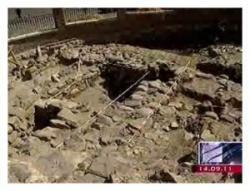 This find could potentially change the historical date that Tbilisi was actually founded. Scientists found that layers of the ancient palace date back to an earlier period than current historical records suggest. It is during the reign of King Vakhtang Gorgasali that Tbilisi was previously believed to have been founded. They also found the fence of the fortress, which dates back to the fourth century. This discovery confirms the version that the territory of current Tbilisi was populated before the era of the King Vakhtang Gorgasali. Scientists also discovered ancient baths there, which they say were constructed in the first and second centuries AD. Scientists are also exploring several dishes and some jewelry that was found in the sepulcher of an 11-12 year-old girl. According to historians, Vakhtang Gorgasali, the Georgian King of Iberia founded Tbilisi in the 5th century and made it into a capital in the 6th century. It played a significant role and was and remains an important transit-route for global energy and trade projects. - BULGARIE – Assen - A team of more than 20 archaeologists that has been clearing vegetation on the eastern side of Assen’s Fortress in Bulgaria’s Rhodope mountains has uncovered the remains of a medieval residential area adjoining the fortress. Rositsa Moreva, who has been supervising the current study of the site, said that the residential premises appeared to have been for soldiers and their families. The garrison was at the fortress to guard the strategically-important point of access to a route to the Aegean. The remains of an armoury also were found, as were large numbers of coins dating from various eras. Current excavations will continue for a further month. 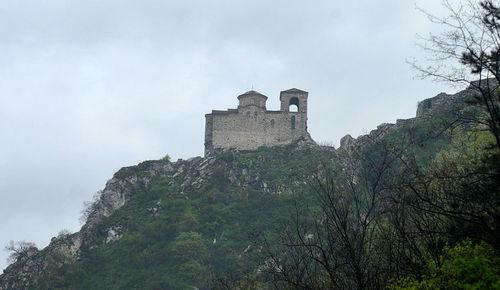 Assen’s Fortress is on a steep hillside about two km outside Assenovgrad, close to the left bank of the Assenitsa River. Fortifications on the site date back before the 11th century, going by the records of the nearby Bachkovo Monastery, which mention a fortress there before that time. A church on the site, St Mary Petrichka, is said to date to the 12th century. - FRANCE – Guingamp - Château de Pierre II - Les premiers contacts avec l'Inrap remontent à l'an 2000, à l'époque où la municipalité envisageait sur le site la construction d'une salle de spectacle à dimension du pays. Passé aux oubliettes pour raisons financières, ce projet a toutefois eu le mérite d'engager des fouilles importantes, dans le cadre de l'archéologie préventive. Réalisées d'octobre 2004 à mars2005, elles permettront de mettre au jour les vestiges du château, depuis sa fondation au XIe siècle jusqu'à sa destruction au XVIIe. «Ce sont des fouilles qui ont engagé des moyens mécaniques importants», a rappelé l'archéologue. «Il y a une vingtaine d'années, tout à la main, cela n'aurait pas été possible», a-t-il souligné, pour évoquer les véritables travaux de terrassement réalisés avant de dégager les premiers vestiges. Premier enseignement : «Les logis seigneuriaux, à l'intérieur du château, n'ont jamais été construits.» Question: «Pourquoi a-t-il été abandonné en cours de construction?» Revenant sur les étapes du travail des archéologues, Laurent Beuchet a expliqué que «les fouilles préventives démarrent toujours par un décapage mécanique». Ensuite vient «le démontage du site, couche par couche». Et une belle image pour résumer leur travail: «C'est comme si on lisait un livre en commençant par la dernière page, en arrachant les pages au fur et à mesure. Arrivé à la couverture, il faut être capable de raconter l'histoire.» «Tout ça pour quels résultats?» Car il faut savoir que ces fouilles ont coûté très cher à la ville de Guingamp. «Un des points faibles de cette fouille, c'est qu'on a trouvé très peu de mobilier», a admis l'archéologue qui a insisté sur un point: «C'est un des plus anciens châteaux fouillés de Bretagne.» Avec son caractère défensif attesté à toutes les périodes, le château dit de Pierre II serait «un des tous premiers châteaux d'artillerie construits». - USA – Moundville - A group of UA students helped to uncover two hearths at the Moundville Archaeological Park this summer. The group, made up of a field archaeology class, excavated the hearths after using a research instrument called a magnetometer to reveal where they might be. The magnetometer revealed that the Moundville’s ‘plaza’ had not always been a plaza; it was once one of the more populous areas of the site. Along with the hearth, Owens said they also discovered three post-holes where wooden posts once stood. “Two were on the outside of the hearth and one was actually penetrating part of the hearth itself on the western side,” Owens said. “This suggests that the hearth was covered up at some point and the family who returned had to replace a post, chose a random spot and it just happened to hit the hearth.” According to Davis, the last hearth that was discovered at Moundville was found in the 1990s. - TURQUIE - Göbekli Tepe - Over the last 15 years, Klaus Schmidt of the German Archaeological Institute and colleagues from the Şanlıurfa Museum in Turkey have been making remarkable finds at the site of Göbekli Tepe, a barren hilltop northeast of the city of Urfa. Schmidt has interpreted the buildings with enormous pillars, some engraved with pictures of animals, as the world’s first temples, some 11,000 years old, and has suggested that this large site was covered with such temples, rather than houses. Ted Banning offers an alternative interpretation of this exciting site that challenges some of Schmidt’s claims about it. He presents the possibility that the large structures found in the earliest level at the site, rather than being temples, may be very large and impressive houses, similar, in some ways, to the large plank houses of the Northwest Coast of North America with their impressive house posts and totem poles. If so, they would likely have housed quite large households that might provide an extremely early example of what the French anthropologist, Claude Lévi-Strauss, called “house societies.” Such societies often use house structures for competitive display, locations for rituals, and explicit symbols of social units.